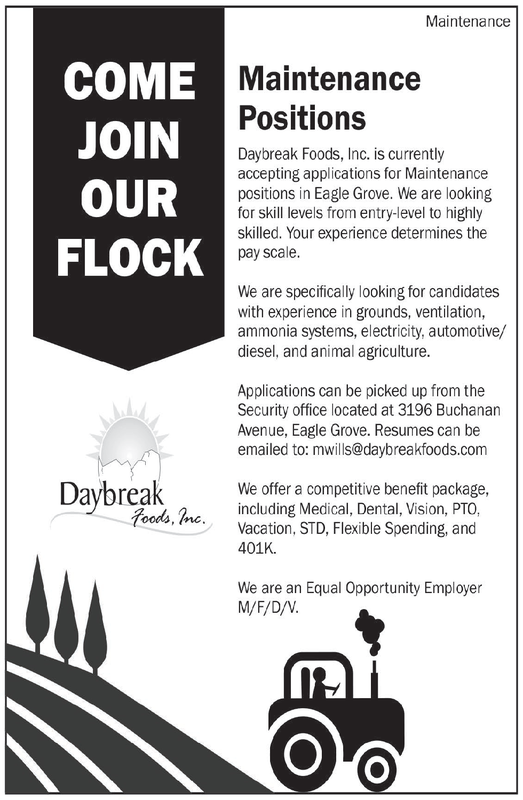 Daybreak Foods, Inc. is currently accepting applications for Maintenance positions in Eagle Grove. We are looking for skill levels from entry-level to highly skilled. Your experience determines the pay scale. We are specifically looking for candidates with experience in grounds, ventilation, ammonia systems, electricity, automotive/diesel, and animal agriculture. We offer a competitive benefit package, including Medical, Dental, Vision, PTO, Vacation, STD, Flexible Spending, and 401K.